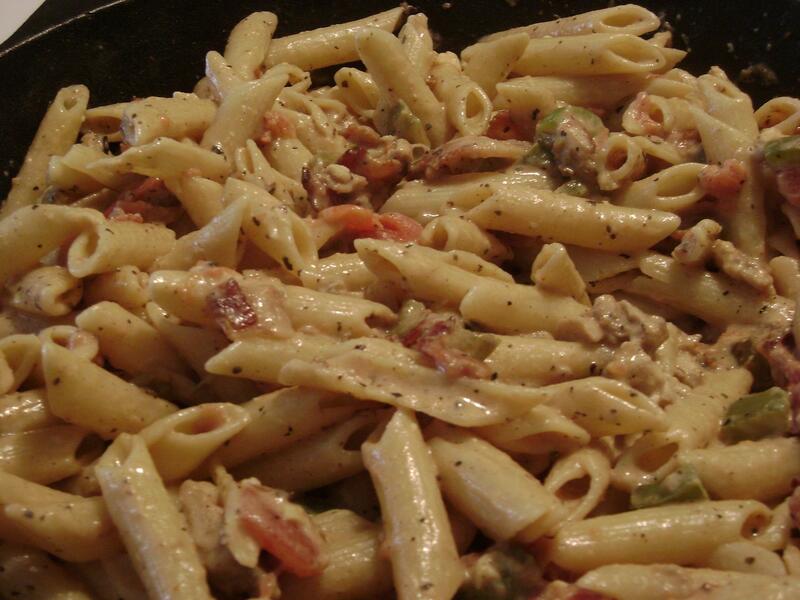 This dish is inspired by my aunt’s tomato cream pasta and my mom’s pasta carbonera. There’s a lot of changes from both and an ingredient or two that isn’t in either recipe, but that’s kind of just what I do with recipes. When I called him to dinner Ben looked at this pasta and decided, even without tasting it, that it looked better than restaurant pasta and I should write up the recipe and make millions with it. I’ve told you before what a spoiled girl I am, but goodness, I love him! Anyway, tasting the pasta showed that it was amazing. Creamy, bacon-y, some good veggies, nice protein, did I say bacon-y already? My kitchen smells heavenly too. Yum. Definitely worth writing the recipe down(rare for me, since I usually like to wing things) and probably worth sharing, so here ya go! Set pasta water to boil and cook pasta according to package directions. While you are waiting for the water to boil, start the bacon in a deep skillet(I used my cast-iron skillet) on medium heat. When the bacon is half cooked add in the peppers and chicken and a few grinds of fresh black pepper and continue cooking until the bacon is done. Remove the bacon, chicken, and peppers from the pan and set aside. Dump the tomatoes and basil into the skillet and simmer until the tomatoes have thickened. Lower the heat. Add the cream cheese in several chunks and the milk. Stir gently as the cream cheese melts and keep the heat low enough that the sauce doesn’t boil. As soon as the pasta is done drain and return it to the pot then quickly stir in the eggs. Keep the pasta moving for a minute so that the eggs cook on the hot noodles and not the bottom of the pot. Add the Parmesan cheese and stir well then dump the noodles into your skillet(or the tomato cream sauce into the pot, if you’re making a bigger batch than this). Dump in the bacon, chicken and pepper mixture and stir until everything is well combined. Salt and pepper to taste. Enjoy and good luck trying to not eat the whole batch in one sitting. Makes six normal servings or one super hungry, physical-labor all day husband, one pregnant wife and a couple of small servings in the fridge for later(probably to be supplemented by a good size salad).